From the Cumberland Gap to the Atlantic Ocean, this is Virginia Water Radio for the week of April 27, 2015. This week, we drop in on a public hearing about a subject that was on the agenda of every Virginia locality at some point between 2005 and 2011, and this month re-emerged at the state level. Have a listen for about 45 seconds. SOUNDS – Storm, Stream Flow, Pouring Water – 9 sec. The Virginia Water Resources Plan released (draft form) in April 2015 is a landmark in Virginia’s long history of water-resources management. 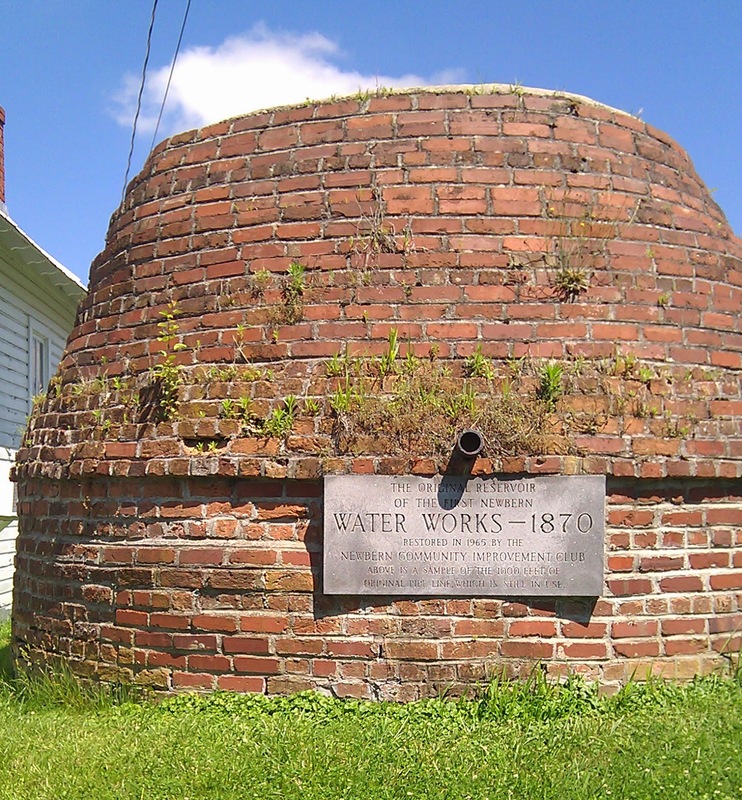 The historic reservoir structure shown above was photographed in Newbern (Pulaski County) in June 2013. Local drought protocols are one part of the Virginia Water Resources Plan, released (draft form) in April 2015. Shown above is a literally dry Dry River in Rockingham County on November 25, 2007; at the time, over 87 percent of Virginia was rated in “moderate drought” by the U.S. Drought Monitor (see http://droughtmonitor.unl.edu/MapsAndData/MapArchive.aspx). The voice excerpts used in this episode were recorded by Virginia Water Radio at the Montgomery County Board of Supervisors meeting in Christiansburg, Va., on October 11, 2011. This episode updates Episode 85, 10/24/11; the audio for that episode has been archived. Virginia Department of Environmental Quality, “State Water Resources Plan open for public comment,” 4/7/15 news release, available online at http://www.deq.virginia.gov/info/newsreleases.php?show=2499. Virginia Department of Environmental Quality, “Water Supply and Quantity,” online at http://www.deq.virginia.gov/Programs/Water/WaterSupplyWaterQuantity.aspx (see “Water Supply Planning” link for information about the statewide planning process). Virginia Legislative Information System, Senate Bill 1221 in the 2003 Virginia General Assembly (the bill mandating a statewide water-supply planning process), online at http://leg1.state.va.us/cgi-bin/legp504.exe?ses=031&typ=bil&val=sb1221. U.S. Geological Survey Virginia Water Science Center, “Water Resources of Virginia,” online at http://va.water.usgs.gov/. Virginia Water Resources Research Center, “Virginia Water Central News Grouper” posts on news, events, and information resources relevant to water supply, online at https://vawatercentralnewsgrouper.wordpress.com/category/water-supply/. Virginia Water Resources Research Center, “Water Supply Planning on the Agenda in Virginia and Several Other States,” Virginia Water Central newsletter, November 2009, p.7, online at http://vtechworks.lib.vt.edu/handle/10919/49360. For a subject index to all previous Virginia Water Radio episodes, please see this link: http://www.virginiawaterradio.org/p/index.html. This episode may help with the following Virginia’s 2010 Science Standards of Learning (SOLs). The episode may help with the following Virginia 2008 Social Studies SOLs.